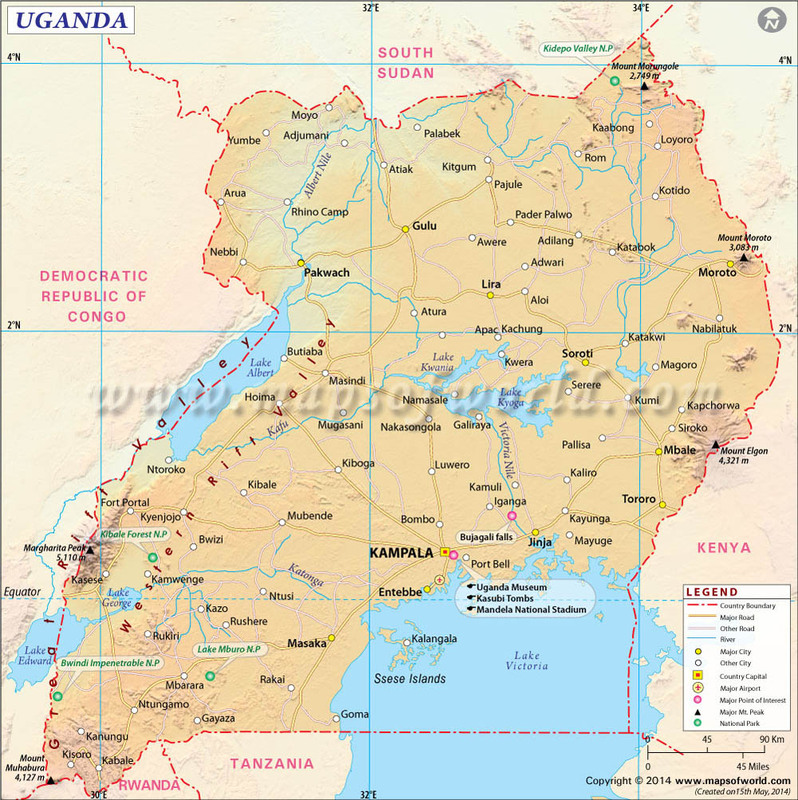 Uganda is an east African country with a total population of 34.51 million (2011). As an independent country Uganda became a free nation in the year 1962. The national flag of Uganda was adopted on October 9, 1962. The flag is made up of six horizontal stripes of black, yellow, and red, with the national crane in the center on a white disc. The earliest inhabitants of Uganda were hunter-gatherers of various small tribes. Uganda's central location in Africa and its relatively wet climate brought migrants from around Africa, like the Bantu who arrived at least as far back as the 400 BC. The Bantu people were an agriculturally based society that grew and spread across the region, and eventually organized into states, and Chwezi rulers emerged. Around the 13th century, the states included the Hima, Bito, and Buganda. The Hima society had a caste system, while the Bito people were ruled by the Bunyoro royal clan, and the Buganda society had more of a multi-party ruling system, in which clan leaders selected each successor. The Buganda, from which the name Uganda is derived, began to rise in power and expand, conquering the surrounding lands. Trade with Arabs began in Uganda around 1830, and by 1860, the British had followed the Nile River to arrive in Uganda. After sending missionaries to the region and some internal conflict, the UK made Uganda a British protectorate in 1894. The British brought laborers from India to build the Uganda Railway. Discontent of the Buganda people grew, with the restrictions the British placed on trade of the country's cash crops. Uprisings of the Buganda around 1949 led to a fight for self-government. Uganda gained independence from Britain in 1962. Its first years of independence were wrought with struggle, including the ousting of Prime Minister Milton Obote by a military coup, and Idi Amin Dada was the self-appointed president for the next several years, until he was removed and replaced. Since then, Uganda has faced continued struggles, including involvement in the Second Congo War between 1998 and 2003. Uganda shares borders with Kenya, South Sudan, the Democratic Republic of the Congo, Rwanda, and Tanzania. 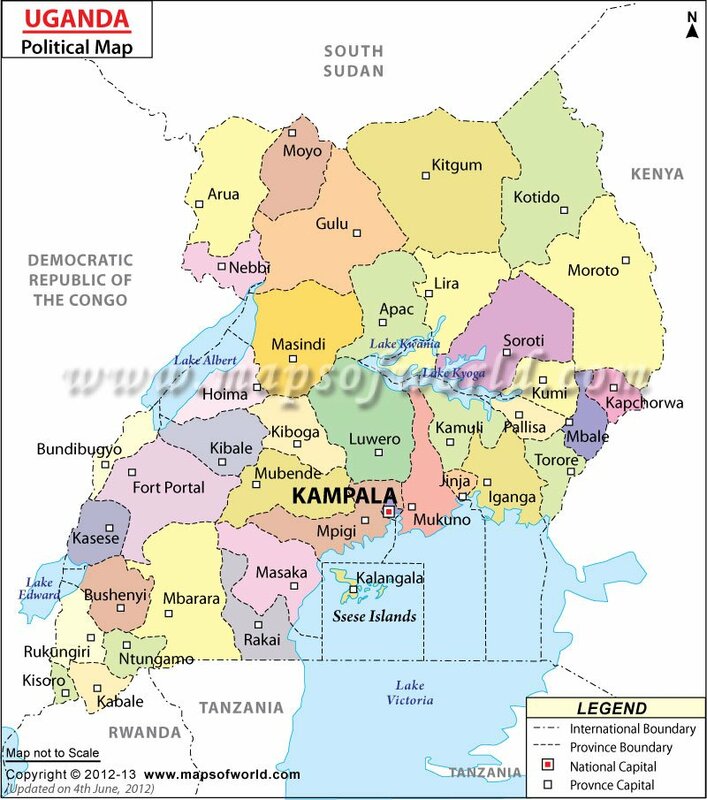 Uganda is a landlocked country located in East Africa, though there are many major lakes in the country. Uganda's southeastern corner contains a major body of water, Lake Victoria, which is shared with neighboring Kenya and Tanzania. On its western border, the much smaller Lake Albert is situated along the border with Democratic Republic of the Congo, into which flows the Albert Nile River. Centrally located in Uganda is Lake Kyoga, which is fed by the Victoria Nile before it flows into Lake Victoria. The climate of Uganda is tropical, though fairly dry in the north, and much wetter in the south, and the country is located along the equator. Much of the terrain of Uganda is highlands, including a plateau and mountain regions. The country has areas of savanna and cultivated farmland and once had rainforests, though it has suffered from deforestation. The highest point in Uganda is Margherita Peak, which is located on Mount Stanley in the Rwenzori mountain range, with an elevation of 5,110 meters (16,763 feet). Uganda has a large number of scenic and natural attractions, with several national parks and game reserves. Important parks include Rwenzori National Park in the mountains of Uganda, known as the mountains of the moon, while Kibale Forest National Park is home to wildlife like chimpanzees and many bird species, and is located near the Kasese Crater Lakes. Other places to spot the country's diverse wildlife include Queen Elizabeth National Park, with crater lakes, the Ugandan Kob, and the continent's highest concentration of Hippos, while Mgahinga Gorilla National Park and Bwindi Impenetrable National Park are good places to spot wild gorilla populations. There are safari camps and tours in many of these parks, as well as the Ajai Gamer Reserve. At Murchison Falls National Park, visitors will find various types of wildlife from elephants to giraffes, buffalo, and lions, as well as impressive waterfalls from the Nile River. Lake Victoria is a beautiful destination for outdoor recreation, and the Ssese Islands within the lake offer scenic beaches and jungles. The capital, Kampala, has some attractions, like cathedrals and mosques, the Bahai temple, the traditional Wamala tombs in which royalty are buried, parliament buildings and museums and galleries. The city also has markets for local produce and crafts. The main point of entry to Uganda is via Entebbe Airport, which offers service from Johannesburg, London, Dubai, Cairo, and a few other European and African locations. There are also some domestic flights operating in Uganda, which is fast way to get across the country. Driving into Uganda via car or bus is possible, with several companies offering service from Nairobi and a few other cities, but that journey can take half of a day to make. Arriving in Uganda by boat is also possible across Lake Victoria. Travel within Uganda can be managed by the public transportation system, which includes buses and minibuses, which can transport passengers between cities and around them. Roads around Uganda can be paved or dirt roads in varying degrees of upkeep. Minibuses are inexpensive, and private taxis are more costly. The boda-boda is a small motorcycle that can be hired for transportation around the cities, but they can be quite dangerous.